I’m back in the studio. My goal in 2017 was to play out and write a new song once a month. I overshot the first goal with 14 gigs last year and came up only 1 short on the second goal with 11 new songs. Everything gets better with practice. I can learn, memorize, and perform three hours of music, no problem, most of it mine. It’s fun to play out a lot, meet people, watch them dance to your music, and watch the list of people who care about your music grow little by little. Songwriting is still an arduous process for me, but my songs get better the more I write. I need to do this. Much as I hated the idea of not playing out for a while, once I got back into the process of recording, which I’ve talked about before in my blog, I remembered how much I like it. It’s so painstaking, so slow, so meticulous (or at least the way I do it), that it kind of drives me nuts, but I am also loving it. I recently accepted a promotion to a demanding, interim position in my day job, and I played with the idea of putting music to the side for a while and postponing starting my CD. I tried that on for a few weeks in December and quickly realized what a mistake it was. This worries me, because I hate the idea that my music is nothing more than a vanity project to keep a working stiff from losing her mind. Then I remember the faces of the folks I didn’t know who happened to be there when I was performing and who closed their laptop to listen, put down their fork to dance, or moved closer to make sure they caught every word. I remember these faces because they encourage me when I wonder if the time I spend practicing instead of being with my family in the evenings is worth it. Yes, I could do music just for myself, but if there is no one else who wants to listen or cares, it is so much harder to justify the effort. Maybe that’s codependent or whatever, but it’s true for me. I am really looking forward to bringing this new CD to you, probably in about 18 months if I’m realistic. 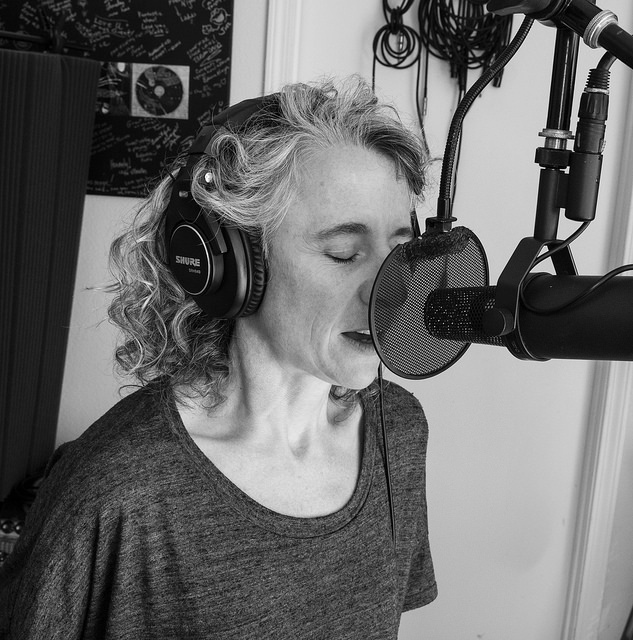 I did my first recording session a few weeks ago, and recently received the initial mix of the first song … Cheers for Tears, which I used to close my sold-out EP release show a year ago November. Even my teenaged daughter says it sounds good. Now I’ve sent off two more songs to Kenny (my producer) to sketch for another session in a few months. Stay tuned, and thanks for the support. My Facebook music page has 99 likes. I’m frankly a little startled that there are that many, and I’m grateful for every person behind each one. Coming to a show, buying my music, or letting me know on social media and in person that you enjoy what I do helps me to carry on in this solitary and sometimes seemingly ridiculous venture. Even taking a moment to read a post and care about what I’m up to is immense support, and I thank you very much. While no like is more significant than another, it’s fun to watch the odometer roll over to a nice round number, so I will send the next 11 people who like my Facebook music page a free download code for my 4-song EP Something Good. Heck, if you’ve already liked my page and want a free download code, let me know, and I’ll happily oblige. I am grateful for the encouragement, and want to acknowledge that it helps. A lot. 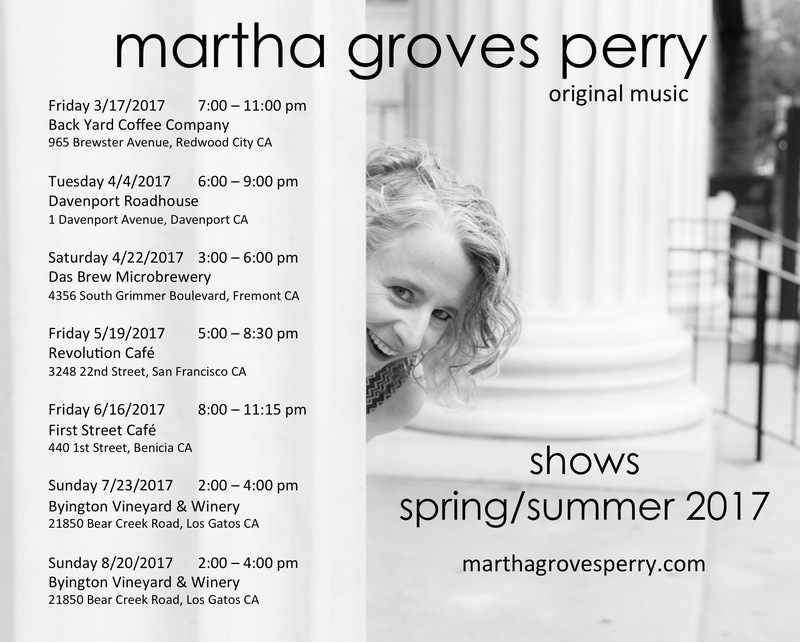 For your free download, please FB message me your email address (I can’t message anyone from my Facebook music page) or email me at martha@marthagrovesperry.com. And don’t worry: I won’t add your email to my list unless you specifically ask me to, and I’ll never share it with anyone else. I started this year wondering if anyone would book me, but I booked out 2017 by mid year, with several invitations to come play again. I also made the goal of writing one new song a month, and still have plans to start recording a full-length CD in 2018. If you want to come along for the ride and get a free download, please click “Like” and join me! (You can also follow me on Instagram & Twitter). In the meantime, I’m playing at East Village Coffee Lounge in Monterey, California on Friday 10/20 – just under 3 weeks from today – at 4-7 pm, No Cover. Details at marthagrovesperry.com. Also plan to stick around afterwards to hear Mike Beck perform “Wooden Music,” his tribute to Stephen Stills & Neil Young at 7:30 – 10:00 pm, $10 cover. Please consider coming and enjoy great food and java in one of the finest venues in the Monterey area, and thanks for everything! Singing. Is there anything else a performer can do that is more personal? Maybe dance. Probably dance. But singing is right up there. Being an instrumentalist, at least at first, is a lot about taming this thing we are trying to coax a melody out of, learning its quirks and intricacies, and figuring out what we can do to make something beautiful come out. If the instrument doesn’t sound good after we’ve learned to play it, then, well, we can blame the instrument. Everyone knows some instruments sound more beautiful than others, and if someone does not appreciate the sound of an instrument, instrumentalists generally don’t take this terribly personally. The voice, however, is a different matter. Yes, singers can learn technique, improve tone, whatever whatever, but at the end of the day, what comes out is not something we can change that much. It is utterly personal. If someone doesn’t like your voice, you can’t blame it on the instrument in the way you can if you could simply pick up a better cello, for example. Much like dance, I’m guessing, you are the instrument. Rejection, therefore, is that much harder to weather. I thought I had a decent voice when several years ago I received some deeply discouraging feedback and a rejection that still lingers a bit in the back of my head. Happily, and with the help of a few friends, this propelled me not into the silence I was contemplating but instead into intensive work, and last month I began to believe that it is paying off. People have said this to me before, and I never really believed them, probably because they are people who know me and love me, so of course they are going to be nice. But other people I don’t know have said it, too, and I didn’t really believe them either. That night, however, I was in fact really happy with my vocals, so the compliments resonated. I came away from Redwood City with a sense that I no longer need to worry if my voice is good enough, especially if I keep working. I also don’t need to worry if my vocals go a little south every once in a while. No one is perfect. In other words, I think I got over the fact that it is me doing it just a little bit more. Another woman named Auntie Lou, having just turned 100, bought my CD that night and insisted that I autograph it. She had come from across the room to listen, and from what I know of centenarians, they don’t waste that kind of effort unless it’s worth it. I’ll take it. I’m playing … and singing … next at Davenport Roadhouse this Tuesday 4/4 at 6:00 – 9:00 pm. I hope to see you there! I’m not a big believer in New Year’s resolutions. One year I made a resolution to eliminate my constant, withering commentary on other people’s driving skills. It didn’t go well. I do tend to use the break between Christmas and New Year’s Day to make some goals and intentions for the following year, however. Last year, it was to get an EP recorded, and that turned out pretty well. This year, my goal is more about process and discipline: I want to finish at least one new song and have at least one gig every month. So far, pretty good. I finished two new songs in December and one in January, but February was so busy with booking gigs that the new song did not get finished (it still needs one more verse and a bridge); I plan to finish two in March to make up for it. I did have a gig each in December, January, and February, so that part is going well, and I’ve booked a little more than one gig a month through August, so I am very happy today to publish my show calendar for the spring and summer. One goal behind the goal is to get lots of experience playing out to build my confidence and skill. When I was on tour a few years ago, I got to the point that I felt no nerves at all on stage, and was able to access a musical place in me that is the closest I have ever come to being fully present in what I am doing, which, when it comes to music, is the happiest place I can possibly be. Getting to that place while playing my originals rather than backing someone else is the next rung on that ladder, and I’m eager to climb. But there is another goal behind the goal, and that is to get enough new songs written to have a good selection, along with the songs I already have that are still unrecorded, to put together a good full length CD in 2018. If you have any interest in accompanying me on the journey this year, I welcome you in any way that suits you – come to a show, buy an EP, post some sweet emojis on my Facebook page, or e. all of the above :). In the meantime, please take a look at my current show calendar, and thanks for reading. Artemesia-Freakin-Black. When I asked them if they would consider opening for my EP release show, part of me was sure they would say no. I even acknowledged that if they opened, the show might be upside down. That’s how much I think of their music. But part of me thought they would say yes, because I knew they were thinking of playing out again after working through the rough patch that losing a loved one inevitably leaves in its wake. When they said yes, I knew I had a show. First, Sabiné’s voice. It has an intoxicating, other-worldly quality. She moves easily from sassy to dreamy. When I listen to her sing, I can’t help thinking about being in art class as a child and looking over at my neighbors’ papers and thinking how much more talented they were because the qualities they brought to their drawings were so different than mine … so they must be better. Sabiné lives into the people that her songs represent so thoroughly, and she’s not afraid to use her voice in ways that I, in my straight-laced efforts to please some imagined singing arbiter, have not yet reached. I am inspired listening to her because of her ease with what her voice is and what she can do with it. Amazing. Second, the songs. Sabiné’s writing is so different than mine. Her lyrics are impressionistic, poetic, and suggestive of many unseen layers. She reaches into a world of deeper truth, even as the stories that the songs weave seem so specific. Beautiful. Third, Kenny. Having submitted five of my songs to Kenny’s ministrations (one being the bonus song I will play with the full band on November 12), I recognize his signature work even though their songs are so different than mine. Kenny reaches into the guts of a song and pulls out its essence, and no matter the genre, seems to know instinctively what the song needs to bring out its full character. Then the damnedest thing is that he can bring that vision – if an auditory experience can be described that way – into existence. The interplay between what Sabiné brings with what Kenny sculpts around her voice, melody, and lyrics is intoxicating, especially when you really allow yourself to listen closely, and preferably more than once. Stunning. ArtemesiaBlack has so much to offer, so please come to my EP Release Show at Art Boutiki on Saturday, November 12, 2016 to hear them. They will open, I will play a solo set, then Dave Maurischat, Chris Lanier, and Will Diamond as well as Kenny and Sabiné will back me in a full band set. We had our first band rehearsal last week, and we’re going to blow the doors off …. S how time is 7:30 pm, and advance tickets are available here for $10 plus a small transaction fee, or by clicking on the icon to the right. You can also buy tickets at the door for $10. I can’t wait to hear ArtemesiaBlack on November 12, and I sincerely hope you will be there to listen, too. Please come on November 12. I started dreaming music about five years ago. Not all of my songs originate from dreams, but most do. I wake up in the middle of the night with a melody in my head, sometimes with lyrics, and stagger to my iPhone in the next room, sing it into a voice memo file, then stagger back to bed. I consider these little gems as gifts from elsewhere. The songs that come from them are from me and through me, but they feel like donations made on my behalf that are meant for others. Despite many other things she has said to discredit herself, Michelle Shocked had a small quote posted on her website that I took to heart when I got home from touring with her: “Make your own music. It is possible.” I was afraid of extending myself this way, but felt guilty about ignoring the nocturnal sprinkling of jewels I began receiving. my life felt out of control, and I vowed never to do anything without a clear call, and always to do what I felt called to, even if I didn’t want to. Without this call, I would have abandoned songwriting a long time ago because it is nerve-wracking having your insides suddenly on the outside and packaged in a way that demands a listener. Doing an EP is exponentially more nerve-wracking for this reason, but at the same time, hearing my songs fully produced has had a strangely soothing result, even with scratch vocals. I saw an interview with Gwen Stefani recently in which she said that when she releases a new CD, she plays it on repeat in her car for weeks because listening to herself singing her own songs is therapeutic. 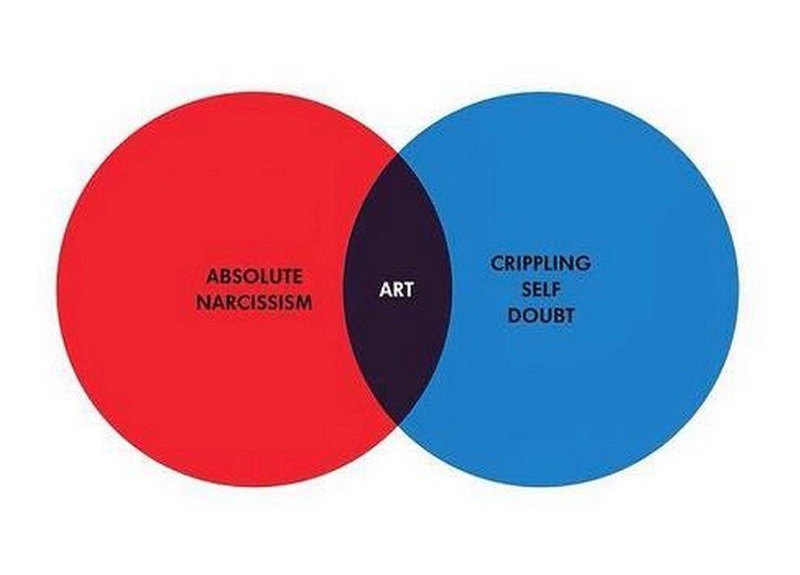 I was startled, because I had thought myself wildly narcissistic because I am doing the same thing with my EP. Every time I listen, an empty place in me fills in a little more. It is the place I used to try to fill with other people’s opinions of me, which is why it was still empty. The opinions of others fail to satisfy. Instead, I am slowly filling it with confidence that comes from being obedient to what I think I am supposed to be doing. Passion is never enough; neither is skill. But try. For our sake and yours forget your name in the street; tell us what the world has been to you in the dark places and in the light. Don’t tell us what to believe, what to fear. Show us belief’s wide skirt and the stitch that unravels fear’s caul. I take heart from this thought – that sharing stories with one another authentically and thoroughly is what we need from each another. Songs penetrate easily the gate the intellect hammers up around our true selves. Songs drop straight into the heart. I am moved when people tell me that my lyrics and melodies touch them; hearing this is encouraging and deeply appreciated. Even so, their experience cannot be why I write. I write out of faith and obedience to a call that comes from a longing that has always been deepest in my heart – bringing myself forward in song. Songs demand a listener, however, and my EP Release Show at Art Boutiki needs lots of live listeners. Please do what you can to come on Saturday, November 12, 2016 to help me celebrate the release of my EP; please click the icon to the right for tickets. ArtemesiaBlack opens, I will play a solo set, then you will see and hear Dave Maurischat, Chris Lanier, and Will Diamond join Kenny Schick and Sabiné Heusler-Schick of ArtmesiaBlack back me in a full band set. Show time is 7:30 pm, and advance tickets are available here for $10 plus a small transaction fee. You can also buy tickets at the door for $10. Please come on November 12. 3 EP Songs Selected by Women of Substance Internet Radio! Here’s a nifty bit of news … My EP is getting some national attention! Three songs from my Something Good EP were selected by Women of Substance Internet Radio to appear in their regular rotation! Each song will join the rotation after being introduced at 3-week intervals in their “What’s On My iPod?” New Music Show, then will later be featured on their award-winning podcast. I See You will be introduced first, daily at 5 pm ET / 2 pm PT, October 3-7, 2016. Please listen to the New Music Show here, and please consider helping me spread the word about this, my EP release show, and the EP itself by giving me a shoutout online on your favorite social media. Please also come to my EP release show at Art Boutiki on Saturday, November 12, 2016. Thank you so much for your support of me, live music venues like Art Boutiki, and local musicians including Dave Maurischat, Chris Lanier, and Will Diamond, who will join Kenny Schick and Sabiné Heusler-Schick of ArtemesiaBlack in backing me. ArtemesiaBlack will also open the show. Show time is 7:30 pm, and advance tickets are available here and by clicking the icon on the left for $10 plus a small transaction fee. You can also buy tickets at the door for $10.